Opposition leader asks Netanyahu to 'represent Israel, not Bennett' and speak about two-state solution wth US President Trump. Opposition leader Yitzhak Herzog (Zionist Union) called on Israeli Prime Minister Binyamin Netanyahu not to forget his promise to advance the "two-state solution." 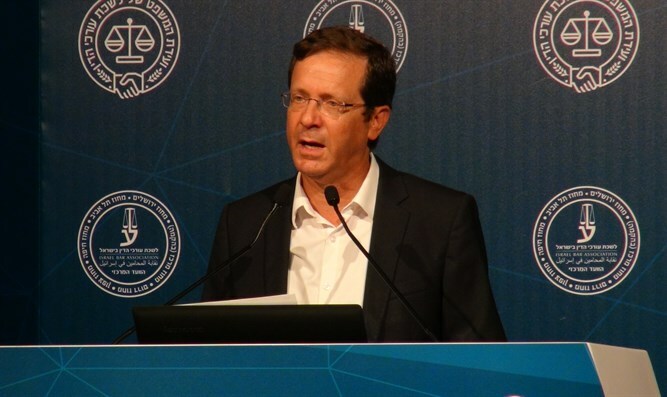 "The dream of one land for two nations, which Education Minister Naftali Bennett (Jewish Home) is promoting, serves the purpose Israel's enemies want most: the loss of Israel's identity as a Jewish nation," Herzog said. "Netanyahu must decide whether he is traveling to the US as Israel's Prime Minister or as Naftali Bennett's Foreign Minister. "Netanyahu needs to choose whether he will continue to crawl embarrassingly after the extreme right, who want to annex into Israel a million Arabs, or if he is willing to be a strong and responsible leader who will speak to the US about a two-state solution. "A two-state solution will ensure Israel continues to exist as a Jewish and democratic state. This is the State of Israel's top priority," Herzog concluded. On Saturday night, Bennett wrote an article encouraging Netanyahu to "drop" the discussion on a two-state solution and speak with Trump instead about annexation. Last week, Herzog called Bennett "messianic" and said he would "love to kill a two-state solution."